Dwarfcraft makes pedals that take an input signal, hit it with a meteor, catch it on fire, bathe it in acid, and then set it on fire again. (Dwarfcraft’s inimitable Aen also makes strange and highly entertaining demo videos.) Both of these pedals have a Starve knob that actually robs the circuitry of power, making what’s already distorted and heavy even more broken, robotic, synthy, and strange. Not for the lighthearted. I picked them up from Mike at the awesome EffectOrDie.com. 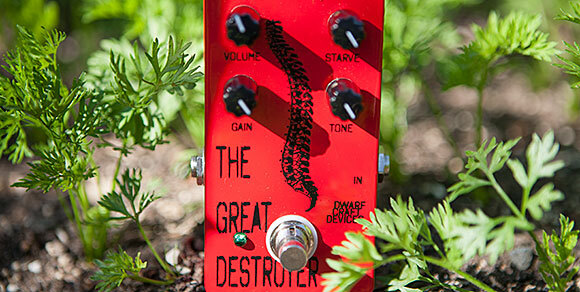 The Great Destroyer is an aptly-named pseudo fuzz pedal. If all knobs but Volume are set to their max values, it acts as a heavy fuzz pedal with an almost synth-like quality. Once you start moving that Starve knob down from its max, though, all sorts of weirdness starts, and rhythmic glitches take hold and it becomes either unholy or awesome, based on your point of view. Only significant input signal will stop the satanic rhythms, and note releases/decays are extremely strange. 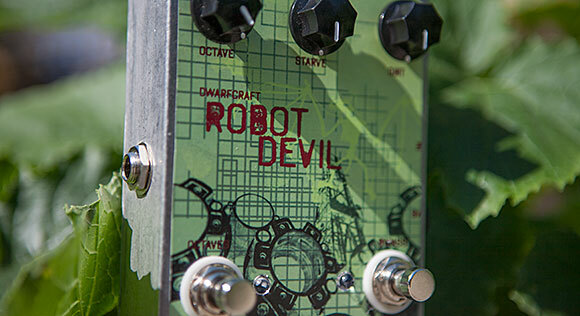 Robot Devil (discontinued) has more of an octave-shifting synth thing going on. Like all things Dwarfcraft, the pitch and chaos and everything leads downward. It’s kind of a Great Destroyer-minus-minus. It has more synthetic tone and can get overdriven chiptune-like tones with pretty much any input signal. Note releases sometimes dive in pitch, sometimes become rhythmic, and are always interesting. All of which leads us to today’s sound samples. In order to showcase the weirdness of the Wow and Flutter, I struck guitar strings above the nut and below the bridge with a glass slide (for playing lap steel style). The pedal was set to maximum warping and some delay, first clean but then through the not-set-to-destroy Robot Devil. Today’s second sample is more musical…but since this blog is more sound design than music, well, there’s still occasion for some experimentation. First you’ll hear The Great Destroyer in the left channel and the Robot Devil in the right channel, each with a guitar plugged into them…which wasn’t being played. When cranked and starved, the pedals make their own noises! These were each fed through an Electro-Harmonix Deluxe Electric Mistress flanger pedal and some delay in software. Then you’ll hear three tracks flown in of guitar that’s fed only through the Wow and Flutter pedal with more subtle settings than the previous example, the panned ones having picked textures and the center one with fretboard hammer-ons. A bowed piano sampler instrument comes in next, which is then sent to The Great Destroyer via an Aux send*. 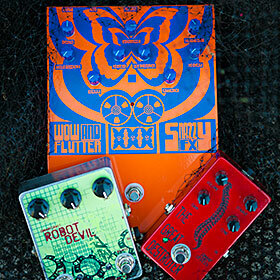 It all returns to the self-oscillating Dwarfcraft pedals after the crescendo.